It seemed natural-- my career in education having been the richer for the mentors who accompanied me on my way—that it was time for me to pay it forward. After two years of e-mentoring National Board Certified Teacher applicants, two extraordinary opportunities presented themselves. In the fall of September, 2005, Anne and I met through the commenting feature on her Teacher Cadet blogging project and I have had the privilege of mentoring her students through the comments on their blogs to date. In March, 2006, Darren put out a call for mentors for his students and described his expectations. Despite the risk and it was great as I am not a math specialist (Darren’s students are enrolled calculus and pre calculus courses), Darren allowed me to jump right in. And so began an incredible journey over the past 2+ years that has been a joy and a challenge. Darren’s recent brilliant initiative has two of his incredibly bright and giving seniors mentoring the grade 8’s in the Thin Walled Classroom of Clarence and Barbara and posting their efforts to a comment blog. Hoping to support this remarkable project and these exceptional young mentors in some small way, I’ve left comments that I hope might that may be of value as they embark on this amazing trek. Today, as I’m writing, Clarence has described the beauty of this “circle”. In my enthusiasm to share what have seemed to be effective strategies for supporting learners, I’m finding it increasingly difficult to sit on my hands and not get in the middle. Having only moved out of the middle (after an exhiliarating learning experience in MOOM ) late in my career, and striving to perfect my own hybrid practice of teaching with my mouth shut , I’m far from expert. And I find increased tension as those old “instructivist” urges periodically surface. It’s then that I do have to sit on my hands and remind myself of the joy of construction of meaning and the possibilities modeling offers-- Only then, can I hope that my fingers can help me find the right tone for the opening celebration of the post I’m reading as Grey-M did so effortlessly here . I find the dissonance rising anew while seeking a focus for a comment that might deepen understanding, sharpen focus, or extend thinking. Seeking to understand the protégé’s perspective, and then constructing a meaningful comment that will encourage and nurture, with question that may lead to deeper learning is good, hard work (Grey-M’s comment is a perfect exemplar as is Mr. MrSiwWy's ), especially when distance prohibits gauging reaction by searching deeply into eyes or reading body language. So much easier just to tell; yet always cognizant of Mary’s response to my comments: “You said in such a way it was like a gentle whisper in the breeze.” and her podcast that affirmed that the comments had been of value, I sit on my hands again. The possibilities for developing meaningful relationships that positively impact the lives of all involved. The possibilities that joyful learning and discovery may ensue. The possibilities that those “Aha” moments will truly be remembered. The possibilities of learning more about mentoring, them pushing my thinking as I push theirs (perhaps this notion of mentor/protégé should be renamed?) -- And the possibilities that their protégés will pay it forward too! This from an educator of 35 years--- I shake my head in amazement at the maturity and excellence of these teens as mentors, constantly reminding myself that they’re high school seniors-- Filled with exhilaration and the trepidation that accompanies good learning, I’m wondering if Grey-M and Mr. MrSiwWy are riding the same rollercoaster on this trek with me? thinking about how “talking with” changes all dynamics. “When parents, kids and teachers are on board, it is an empowering experience for learners, but”…………. What are the possibilities when we view conferences with students, parents and teachers as part of the learning process, that of reflection and evaluation? What can happen when we model for youngsters as an expert learner how we reflect upon and evaluate what we learn, scaffolding for them the skills they need to hold their own conferences? In 2002 and 2003, having explored strategies for holding a conference and reflected upon all they had learned, rubric in hand detailing criteria for success, my students conducted their own conferences. Empowering is an understatement--- Parents glowed and asked questions of their son/daughter. Youngsters smiled, trembled, hesitated and for the most part carefully laid out all they had learned, areas in which they had done their best, where there was room for improvement and how they planned to improve. For youngsters who had not done their best, there were often tears interspersed and a renewed goal to take charge of their learning. Only when they and their parents had finished, did I enter in the conversations. What transpired was life changing in a number of cases! What if we called them “Learning Conferences”? What if “student led” became the norm? Just imagine (leave the “but”s and the reservations behind) the possibilities! Time for a new blog meme to help us spread the word about the upcoming K12Online07 conference. Please share either three (3) reasons to participate based on your experience from last year or (if you didn't attend last year) three (3) things you hope to gain from the experience this year. I was tagged by Sheryl. Presentations energize, rejuvenate, and empower. The learning brings great joy! And anyone else who would like to help us spread the word... tag you are it. …handle live events during the conference, our culminating event “When Night Falls” and fireside chats. Please consider donating some of your time as a member of the Live Events committee! More info about volunteering is available on the conference post announcing committees! Never good at games, but tagged by Wes, here's 8 Random Facts! I’ve really become a good vegetarian, low-fat, no-cholesterol cook over the years. MOOM (Moving out of the Middle), an online course from Concord Consortium, profoundly altered my perspective on teaching and learning. When I was 56, harnessed and rigged, I climbed 50 feet into the trees to walk a wire with a student as we pushed our comfort zones. I actually built a file cabinet from a set of directions and it stands to this day. I’m a very amateur gardener who loves nurturing and watching things grow. Over 25 years in Cleveland Municipal Schools, I cherish fond memories of my students. At one point in my teaching, when class met via video conference with students on laptops and content online (and nothing ever worked), I really disliked technology. Some of my favorite music is Gerry Mulligan/Stan Getz jazz. Breaking the last two rules and tagging all who read this to play! Hoping we can help young people to do the same? With only 7 days left to submit proposals, Darren, Sheryl, Wes and I are honored to announce the keynotes for K12 Online 2007. We eagerly anticipate the kick off of the conference and each strand by the following distinguished and accomplished educators. "New Tools" features 3 co-keynoters. David Warlick, a 30 year educator,has been a classroom teacher, district administrator, and staff consultant with the North Carolina State Department of Public Instruction. For the past ten years, Mr. Warlick has operated The Landmark Project, a consulting, and innovations firm in Raleigh, North Carolina. His web site, Landmarks for Schools, serves more than ten-million visits a month with some of the most popular teacher tools available on the Net. David is also the author of three books on instructional technology and 21st century literacy, and has spoken to audiences throughout the U.S., Europe, Asia, and South America. David blogs at http://davidwarlick.com/2cents/. 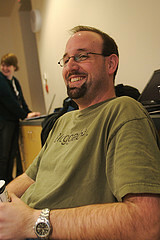 with his class at mr-fisher.edublogs.org and has spoken at conferences across North America. Clarence has won several awards, including one of Canada’s highest teaching awards, the Prime Minister’s Award for Teaching for his integration of technology into daily classroom life. Clarence's innovative classroom practices have been featured online, in books, magazines, and newspaper articles. He is an advocate of classroom 2.0, learning spaces that take complete advantage of the tools that are available to learners in their quest to learn rather than having school be something that is done to them. Alan Levine Vice President, NMC Community and CTO for the New Media Consortium (NMC), an international consortium of more than 250 world-class universities, colleges, museums, research centers, and technology companies dedicated to using new technologies to inspire, energize, stimulate, and support learning and creative expression. He is widely recognized nationally and internationally for expertise in the application of new technologies to educational environments and was a pioneer on the web going back to 1993. Alan blogs at http://cogdogblog.com. Brian Lamb is Manager, Emerging Technologies and Digital Content with the Office of Learning Technology at The University of British Columbia. He teaches a course on “Text Technologies” for UBC’s Master of Educational Technology Program. He is also a Research Fellow with Utah State University’s Center for Open and Sustainable Learning. Brian maintains his weblog Abject Learning http://weblogs.elearning.ubc.ca/brian/, where he mutters ll-tempered observations on social learning, open education, disruptive technologies and other such things. D'arcy Norman is a software developer at the Teaching & Learning Centre, a service department at The University of Calgary. In his current primary role, as an educational technology developer, he explores new technologies and works with faculty to implement tools for blended learning. He has also been involved in the open source development of the Pachyderm project, an easy-to-use multimedia authoring tool. D'Arcy spends a fair amount of time thinking (and rethinking) about the concept of control and copyright, and how they might affect academia. D'Arcy blogs at http://www.darcynorman.net. Education Ltd based in Christchurch, New Zealand. He has a broad background in education, with experience at the primary and secondary school level, and as a teacher educator. He was manager of the eSection at The Correspondence School in Wellington and is currently an adviser to the Ministry of Education. Derek is a regular speaker at conferences and seminars, and maintains a regular blog where he shares his ideas and thinking across a range of areas relating to the use of ICT in teaching and learning. Derek blogs at http://blog.core-ed.net/derek. Brian Crosby, an elementary teacher for 26 years, teaches fifth grade in Sparks, Nevada, and has infused technology into teaching since the 1980's. While piloting a 1:1 laptop program, students in his class utilizie many Web 2.0 tools including Skype, Fiickr, blogs and wikis. His award winning student produced video about including a classmate that couldn't attend school using video-conferencing software has been downloaded by thousands. Brian teaches several popular tech classes for teachers in his role as a Nevada Writing Project Consultant. You can try keeping up with him on his blog "Learning Is Messy" at http://www.learningismessy.com/blog/. We strongly encourage you to join these educators at the conference by sharing your take on "playing with boundaries" in the use of Web 2.0 tools in classrooms and professional practice! It's time to submit your proposal. The deadline is June 18, only 7 days away! For your convenience, you can find the initial call for proposals here and the link to the proposals submission form is here. Some 19 years ago, I transferred to Jane Addams Business Career Center in the middle of the school year to become the school’s LD resource teacher. In the terms of that era, my students were mainstreamed into the vocational programs and part of my responsibility was to assure their success. Enter Joe. My students were often engaged by and had an affinity for using computers. Many enrolled in the computer applications program which included word processing, spreadsheets, basic, cobol and accounting. 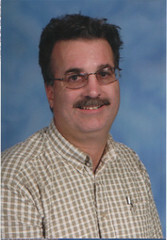 Joe was the teacher in that area on whom I could always depend to work closely with me, to spend extra time with my kids. The kids adored Joe and even when he came to the classroom to share inappropriate behavior, he was met with smiles and happy greetings. I’d visit them in his classroom, there he’d be, crouched down beside them at the computer, pointing and coaching as they struggled with basic and cobol. He made arrangements for a terminal to be installed in my classroom so my students could have extra time to work. He advocated for permission for me to use a terminal at home (the days of 1200 baud modems). But his mentorship extended far beyond the technology—he was a great model for me. Joe and I worked closely together on a school reform project. (It failed but that’s another story and Joe had retired by then.) In those months, the student team, for whom I was advisor with Joe’s assistance, helped conjure a vision of learning that would be transformational today. The student team reflected Joe’s energy, problem solving, and persona and they wore with pride the T shirts he designed. His rapport with the kids was particularly special-- a unique combination of dry humor, honesty, and sincere caring. just that moment, my fears were gone. saving me from an unbearable way." in the wind and to melt into the sun? silence shall you indeed sing. tain top, then you shall begin to climb. limbs, then shall you truly dance." Announcing the second annual "K12 Online" conference for teachers, administrators and educators around the world interested in the use of Web 2.0 tools in classrooms and professional practice! This year's conference is scheduled to be held over two weeks, October 15-19 and October 22-26 of 2007, and will include a preconference keynote during the week of October 8. This year's conference theme is "Playing with Boundaries." A call for proposals is below. There will be four "conference strands"-- two each week. Two presentations will be published in each strand each day, Monday - Friday, so four new presentations will be available each day over the course of the two-weeks. Each presentation will be given in any of a variety of downloadable, web based formats and released via the conference blog (www.k12onlineconference.org) and archived for posterity. Leveraging the power of free online tools in an open, collaborative and transparent atmosphere characterises teaching and learning in the 21st century. Teachers and students are contributing to the growing global knowledge commons by publishing their work online. By sharing all stages of their learning students are beginning to appreciate the value of life long learning that inheres in work that is in "perpetual beta." This strand will explore how teachers and students are playing with the boundaries between instructors, learners and classrooms. Presentations will also explore the practical pedagogical uses of online social tools (Web 2.0) giving concrete examples of how teachers are using the tools in their classes. Research says that professional development is most effective when it aims to create professional learning communities — places where teachers learn and work together. Using Web 2.0 tools educators can network with others around the globe extending traditional boundaries of ongoing, learner centered professional development and support. Presentations in this strand will include tips, ideas and resources on how to orchestrate your own professional development online; concrete examples of how the tools that support Professional Learning Environments (PLEs) are being used; how to create a supportive, reflective virtual learning community around school-based goals, and trends toward teacher directed personal learning environments. Boundaries formalized by education in the “industrial age” shouldn’t hinder educators as they seek to reform and transform their classroom practice. Playing with boundaries in the areas of copyright, digital discipline and ethics (e.g. cyberbullying), collaborating globally (e.g. cultural differences, synchronous communication), resistance to change (e.g. administration, teachers, students), school culture (e.g. high stakes testing), time (e.g. in curriculum, teacher day), lack of access to tools/computers, filtering, parental/district concerns for online safety, control (e.g. teacher control of student behavior/learning), solutions for IT collaboration and more -- unearthing opportunities from the obstacles rooted in those boundaries -- is the focus of presentations in this strand. This call encourages all, experienced and novice, to submit proposals to present at this conference via this link. Take this opportunity to share your successes, strategies, and tips in “playing with boundaries” in one of the four strands as described above. Deadline for proposal submissions is June 18, 2007. You will be contacted no later than June 30, 2007 regarding your status. Presentations may be delivered in any web-based medium that is downloadable (including but not limited to podcasts, screencasts, slide shows) and is due one week prior to the date it is published. Please note that all presentations will be licensed Creative Commons Attribution-NonCommercial-ShareAlike 3.0 Unported. The first presentation in each strand will kick off with a keynote by a well known educator who is distinguished and knowledgeable in the context of their strand. Keynoters will be announced shortly. Darren Kuropatwa is currently Department Head of Mathematics at Daniel Collegiate Institute in Winnipeg, Manitoba, Canada. He is known internationally for his ability to weave the use of online social tools meaningfully and concretely into his pedagogical practice and for "child safe" blogging practices. He has more than 20 years experience in both formal and informal education and 13 years experience in team building and leadership training. Darren has been facilitating workshops for educators in groups of 4 to 300 for the last 10 years. 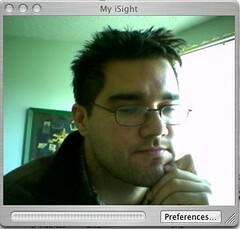 Darren's professional blog is called A Difference (http://adifference.blogspot.com). He will convene Classroom 2.0. Sheryl Nusbaum-Beach, a 20-year educator, has been a classroom teacher, charter school principal, district administrator, and digital learning consultant. She currently serves as an adjunct faculty member teaching graduate and undergraduate preservice teachers at The College of William and Mary (Virginia, USA), where she is also completing her doctorate in educational planning, policy and leadership. In addition, Sheryl is co-leading a statewide 21st Century Skills initiative in the state of Alabama, funded by a major grant from the Microsoft Partners in Learning program. Sheryl blogs at (http://21stcenturylearning.typepad.com/blog/). She will convene Preconference Discussions and Personal Learning Networks. Wesley Fryer is an educator, author, digital storyteller and change agent. With respect to school change, he describes himself as a "catalyst for creative educational engagement." His blog, “Moving at the Speed of Creativity” was selected as the 2006 “Best Learning Theory Blog” by eSchoolnews and Discovery Education. He is the Director of Education Advocacy (PK-20) for AT&T in the state of Oklahoma. Wes blogs at (www.speedofcreativity.org). Wes will convene New Tools. Lani Ritter Hall currently contracts as an instructional designer for online professional development for Ohio teachers and online student courses with eTech Ohio. She is a National Board Certified Teacher who served in many capacities during her 35 years as a classroom and resource teacher in Ohio and Canada. Lani blogs at (http://possibilitiesabound.blogspot.com). She will convene Obstacles to Opportunities. Please duplicate this post and distribute it far and wide across the blogosphere. Feel free to republish it on your own blog (actually, we'd really like people to do that ;-)) or link back to this post (published simultaneously on all our blogs). What joy, what learning, what depth of thought might transform our classrooms if these gifts were graciously accepted, models adapted and then realized? At my feet lies an aging, wise, and loving 100 pound German Shepherd. Rescued from abuse and neglect some 4 years ago, this handsome guy has become an integral family member. I guess it should be no surprise that he blogs and comments to 5th graders in Georgia just like his mom. But the success and scope of this unique and unlikely collaboration has amazed even me. The journey began last January after a significant lake effect snow event. I’d been commenting to the Blogicians in Georgia and thought I’d share some of the snow with them through pictures on this blog. In one of the posts, I asked the students who they thought cried when he saw all the snow (I linked a to his picture in the comments all in fun). Imagine my astonishment when I found Harley looking at me in my aggregator in a post at Blogical Minds. That post indicated that the Blogicians had lots of questions about him. And sure enough, Anni, and Johnny, and Tina had questions and comments. In response, Harley added his voice to the blogosphere at From the Paws of connecting with 5th graders some 800 miles away. His second post was about him and so began his ongoing relationship with Michael and M.V. When the Blogicians tried their hand at persuasive writing, Harley looked to Mary, Lindsey, Eddie and others for guidance before writing his post about a subject near and dear to his heart, rescuing adult and senior dogs. The Blogicians’ comments were thoughtful and kind. One day in March, the Blogicians and I had a short, but exciting Skype call. And when Harley posted on Mom’s happiness at hearing their voices, the blogicians comments were full of excitement! The Blogicians wrote about their passions – T.K. and Victoria, Harley posted on his. As Harley posted, the Blogicians commented with love and kindness. The old guy seemed to touch a spot in the hearts of these bright, insightful 5th graders. His most recent post celebrates the connections he made with Blogicians through blogging. Following that post and a wealth of comments, he popped up in my aggregator again at Blogical Minds! Mia, Victoria and Anni have composed quite a poem! Hmmm, I’m wondering if this might have been one of those great side trips in learning-- an opportunity to write and think and learn about each other? Is there a Harley in your family, who could add an unlikely, unique perspective to a class somewhere? "Here's a cool tool: Answer Tips (see the badge at the bottom of the sidebar). As of right now if you double click on any word on this blog that isn't a link a bubble will appear to teach you something. ;-)"
I am extremely honored to be gearing up for K-12 Online 2007, the second annual conference for teachers, administrators and educators around the world interested in the use of Web 2.0 tools in classrooms and professional practice with Darren, Sheryl and Wes! We wanted to be sure that you are aware of the schedule and request your input as we work to design and develop an exceptional conference experience. If you haven’t already, please mark your calendars with the following conference dates and plan to participate. All published times for the conference will be GMT, and links to time converters will be provided. We need your input! What topics would you like to see this year’s presentations address? What areas are of greatest interest and value to you? In a comment to this posting on the conference blog, let us know your ideas. Your input will be invaluable in the planning of K-12 Online 2007. Next step will be issuing calls for proposals — within the next few weeks! It's not often that the essence of a man, especially a complicated man, can be summed up in one sentence. 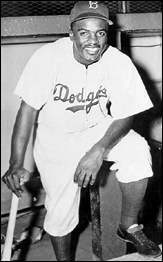 But then again, there haven't been many people like Jackie Robinson. Isn't this a man who should be known and respected by all young people today? Weaving -- quite a tapestry! Trying to wrap my brain around and weave together so much good reading in this last week and now it seems to be coming together. It started with the discussions at Weblogg-ed on a degree for social computing. Will continued with these questions (in a later post) that resonated with me! "Can we systematically teach students to “see the big picture” in ways that will allow them to construct their own process that might actually come close to replicating that formal educational process? Or do those types of potentials only come at a later age or from experiences that cannot be replicated in a K-12 system?" Thank you… all of us at SLA were *thrilled* by that article — they really captured a sense of our school, we felt. I actually said “Yes!” out loud when I read that and knew a post should be brewing. School 2.0, for me, is John Dewey's Constructivist dream made real by the use of 21st Century tools. We must create schools that allow students to dig deep into the world of ideas, setting up structures where traditional subjects lines can be crossed. We must use the tools at our disposal to allow students to research, collaborate, create and communicate. And we must work side-by-side with our students, developing the relationships that the students need to learn how to navigate a changing and difficult world. And then, every decision we make has to be in service of those ideas. Twenty or thirty years younger, Chris, and I’d be one of your applicants to become a member of the SLA community! Where would our students be given the right cognitive backpack and “John Dewey's Constructivist dream made real by the use of 21st Century tools”? Watching what happens here at SLA and here (these are projects from Darren Kuropatwa’s calculus classes; he has posted about Developing Expert Voices here) could provide a pretty exciting picture! What a great start! What can we each do today in order for there to be a better America? Just back from a walk with Harley at the wildlife preserve where the sun shimmered on the cold water from which the ice is retreating; birds lifting voices in song to the clear, crisp air; snow reluctantly receding from all the shaded nooks and crannys; a goose gingerly walking at the edge of the ice near the open water. Old man winter, who waited until January to let us know he was still in charge, seems to be reluctantly accepting the end of the season and spring appears to be creeping in step by step with all it's glorious rebirth of green and wonderful colors of flowers as they greet the warmth and sun. I love this time of year and eagerly search for each new sign-- the robins in the grass, the daffies peeking through the last of the snow, the warmth of sun anemic no more, and the joyous sound of the choir as more and more birds join in. This connection to the rebirth of spring and the demise of winter, to the cycles of nature --touch the core of my soul,helping me bury old hurts, and rejoice in the innocence and possibilities for rejuvenation. The Pre-Cal 40S class have shared lots on their blog! Darren Kuropatwa, their teacher, asks each of them to reflect upon what they’ve learned prior to unit testing. He calls it Blogging on Blogging; his students renamed it BOB. I’ve had the privilege of reading BOBs for about a year now; usually students share what was most difficult for them, often they vow not to get behind again. This semester, these students have taken BOBs to the next level and have provided a real window into learning from their view. In general, I think this unit is easy and fun bcause of the moments where we could all draw on the PRO SMARTBOARD! See how technology evolves and aids us in our daily lives! Gotta love it! Since the time we first received the smartboard, Mr. K has been practicing his smartboarding skills and now it's more than just incorporated into our daily lessons, but is the basis of where we conduct all of our lessons. We now all come up to share our answers with the class on the smartboard, and I think it's ingenious the way Mr. K set up this peer evaluation process mixed with some competitive vigor to help our overall education. With the smartboard, now we're all willing to go up and put up our answer, and whether we're correct or incorrect, we inevitably end up learning. I wonder what the year would have been like without the almighty smartboard. The whole working in group thing was a good idea. I would say it was pretty fun. A lot of people also said that they learned more through working in groups. I have to agree, I did learned a lot of and understood it better working in groups with the whole sharing ideas about how to solve the problem. I have gained much knowledge from the lessons and now that I look back on the earlier exercises I'm finding them a breeze. This is probably due to the group work in class which has been monumentally effective in my mind. All our minds working synergistically to solve problems shines much more effective light on the questions. When we wrote our pre-test for the unit, there seemed to be a sense of tension in the air while we wrote the test. Everyone was silence and the sounds of pencil scratching, calculator punching, and the blowing of eraser shavings off one's desk filled the air. I myself was not expecting such a "tricky" test so I was also thinking and working furiously. After Mr. K. told us to stop writing and split us into groups, the sounds of frantic problem-solving seemed to morph into a more relaxed sharing of ideas. I feel this class was great because different people got a chance to get together and share their ideas and methods, all of which were greatly appreciated. Finally as Mr. K. shared the correct answers with the class there seemed to be a great excitement as if each answer was the winner of and Oscar. Groups exploded with cheers, fist-pumps, and hi-fives to members of their groups whom they weren't friends with before. Groups definitely help mind enrichment due to the fact that integration of minds exists and therefore enhances every member's knowledge about a particular topic. like today, my group members and I shared answers and opinons about our answers. It felt good! There’s something happening here too! Eddie, a bright and perceptive grade 5 student from Georgia with a contagious enthusiasm for learning has discovered the power of commenting! He found Darren’s blog (with a little help from his teacher’s bloglines account) and left quite a comment. He then returned to his blog to post about it and link to what he found and the conversation continued. Darren commented to Eddie here and here and when he shared Eddie’s blog with his Pre-Cal 40S class, not only did they visit Eddie’s blog to encourage him through their comments here and here, they posted about him on their class blog too! I say this for all my classmates, that we were astonished and inspired to learn that a grade 5 student could make such a great blog. This is for Eddie in Georgia. There’s something happening here! Are we listening? I’ve been drawn back and again to Barbara Ganley’s recent post, “On the Cusp: Learning to Pay Attention to the Extraordinary in the Ordinary”. Her words have resonated with me on so many levels as her “slow blog” post seamlessly weaves events from her personal life with the importance of slowing down in learning. On a personal level, my father is also dying, although I sense not in the same way. Daddy’s Alzheimer’s slowly pulls him farther and deeper into a world of his own, and with that descent, I find myself remembering the articulate and loving letters now in my cedar chest that always spoke to me of beauty and love and finding the ordinary extraordinary. With that remembering, I’m finding that I’m far more apt to take time to notice and appreciate the sparkling snow, the call of the geese and their flight across the wintry sky, the fun of digging out of overwhelming snow— away from incessant busyness. It has taken slowing down, going deep, having some time for thoughts to bubble up and rise slowly--to look around, to feel the power of the ordinary instead of just talking about it. ..Even with this reflective blog and my posts about blogging as letter-writing and slow-blogging, I know I moved too fast, glancing at the books piled high, at the road, at the world around me, at the colossal problems in my community and the world. "The explosion of information in the world today, the rapidity of interaction via contemporary modes of communication, the continued blurring of the lines between providing education and offering marketable degrees and diplomas: these and other forces conspire to push educators into a mode of incessant busyness, with increasingly scarce time for solitude and the conversation so indispensable for thoughtful study and reflection." The new rituals .. plunged me back into the pleasures and significance of unexpected informal learning, the importance of paying attention to the local, of learning to look at the road every week and see it, really see it for the first time in twenty-five years, instead of listening to music or zoning out into thoughts of my teaching, of my blogging, of my parenting, of all the things I have left undone. Her words carry me to another time, referenced here, when silence and listening and thoughtful reflection had a profound influence on my life and my learning. A vivid picture of that meeting room, windows open, birds singing, in its simplicity – a moment in time-- to which I yearn to return. How do we help our students How are they expected to slow down if we don't? How are they supposed to have time to think creatively or mess around outside if even the playgrounds we build are managed? I'd like to explore other kinds of unscripted moments in my classes--slowly-- the personal and ordinary, turning them over and over in our hands, connecting them to our formal learning experience and to each other in our pursuit of deep learning about ourselves and the world and how we want to live.. I will continue to try to make them feel as though "the ordinary in our class is extraordinary." A crashed server, thoughtful presentations, and touching base with old friends! As a massive winter storm currently rages across Ohio, I am warm and toasty in a lovely hotel room in Columbus for the annual eTech Ohio conference. On Monday, Chris, Tracy and I paneled a session on the new entry-year teacher online course that we're currently developing. With three units complete, we were ready to show all attendees the potential of this new elearning course. Unfortunately, we had to ask folks to visualize the engaging learning environment as the elearning server crashed. To Chris' and my dismay, the server was still down late that afternoon as we ramped up for our elearning presentation. Isn't technology grand!? 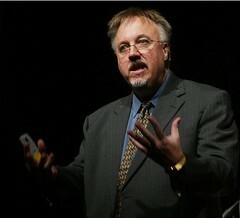 The day was not lost; I arrived in time for Will Richardson's keynote and later attended his session on blogging. I truly appreciated his thoughtful questions and references to good pedagogy. The conference has been a great time to touch base with old friends and colleagues. Mike and Ron from Polaris, Lois and Anita from Cleveland, Paul (my former manager from my days in the Educational Technology Office in Cleveland who I hadn't seen in years)who's now with Educational Funding Group, and Tamera who participated in my blogging workshop last year. She's really taken to blogging with her Spanish students and is presenting on blogging this year! Seeing each of them was special indeed. Tomorrow's my presentation and then we're headed home to what they say will be an additional 20 inches of white stuff. Hopefully we make it down the driveway!! I thought you might like to compare the winters of northeastern Ohio to yours! If you click on this link, you'll see map of where I live. I've posted 4 pictures I've taken in the last two days so you could enjoy our snow too! This one is at home in Chardon! Do you think I had cleared the driveway once already? How can you tell? Does the tree with all the snow paint a picture of something else? What? What one word might you use to describe this picture? You can check in the comment for an answer to the first question. He looked out and he cried! Here's the second picture from home! He asked to go out. I opened the door. He looked out and he cried! Who did I have to make a path for? From his eyes, what did he see? What words would you use to describe the snow? Check the comment to learn for whom the path was made! Here's a third picture that illustrates our weather!! In Chardon, down the hill. How long do you think they are? Is there an idiom you could use to describe this picture? A new meaning to the word shovel! This is the last of snow pictures from Chardon! This big shovel is two lanes wide and its scoop is 3 feet high! Can you see the roof of McDonalds in the back; it’s across the street? Where in Chardon do you think I see this? How high do you think the piles of snow are? What words could you use to describe this picture, the snow mover or the snow? Check in the comment after you've made your decision! Your podcast thanking me for my comments made my heart skip a beat. I was tickled pink to hear it and hope you don’t mind my sharing it with the world in this letter to you. I shall treasure it always. Thank you! You’ve taken the world of blogging by storm! Just think, it was only October when you first posted to Mary's Magic of Fame. You invited your readers to get to know you with your poem which painted a picture worth a thousand words. Our conversations began with your Red Panda and Gogonasus Fish Fossil posts. We’ve been on a roll ever since with questions for each other that makes each of us think. Your extraordinary vocabulary pulls me to read all your posts and your “sweet” tone in the comments brings me back for more. I continue to shake my head in disbelief at our “whisper” word choice. You wrote “You said in such a way it was like a gentle whisper in the breeze.” as you described my comments and I had begun “I’ve been engaged in whispering questions to young people in the comments of their blogs”. No bones about it, I happen to think that blogging is the cat’s meow-- that a grey haired woman in Ohio can engage in conversations with an insightful, thoughtful, perspicacious, and spirited 5th grade student from Georgia. How much we have learned, and I’m thinking the sky’s the limit in the next few months! Did you know Tuesdays are red letter days for me too! It means a new opportunity to dialogue with you! She aroused us to book waving discussions. New ideas cupped and sheltered in our hands like captured fireflies. When she went away a sadness did not go out. She left her signature upon us. The literature of the teacher who writes on children's minds. But only a few like her who created in me a new thing, a new attitude, a new hunger. I suppose that to a large extent I am the unsigned manuscript of that teacher. "We need to give students time to really take delight in their learning. Helping them become reflective learners really does require a different way of teaching and learning in our classrooms." That way of teaching and learning are modeled for us all---These posts of Mrs. C invite, engage, and celebrate the Blogicians here, here and here. What youngster wouldn't take up any challenge or return with some special idea here? And Mary, Lindsey, Eddie, and Emmy respond to truly validate that teaching. Darren's posts invite us to view a group of students creating their criteria for excellence on his unique flickr assignments; his excitement and joy at their collaboration is contagious here. Allen responds to such an environment with a unique and creative scribe and Linger notes the joy of math. The question then is how, in this time of direct teaching and high stakes testing, can we help teachers, especially entry-year teachers to scaffold this kind of joy for and in learning? I find that a real dilemna right now as I work to design and develop an online mentoring course for entry-year teachers in Ohio. Ohio requires that entry-year teachers participate in a year long program intended to help them become more accomplished teachers and experience success on their PRAXIS III performance assessment. The course is framed by the PRAXIS 4 Domains and I see that as a plus. Had I had such structure to guide my practice, oh how my students would have benefited and my path toward accomplished teaching much faster! That said, these new teachers have learned in a world in which joy and engagement have not often been the norm. I'm challenged and determined to add yet another framing to this course, that envelops the 4 Domains-- the Steinbeck poem captures the essence, yet I have miles to go to assure that these fledging educators consider the power which has been entrusted to them. How to best model this learning within a structured management system? How to blend the criteria of the Domains with such a sense that they seek to become that teacher who encourages curiousity, and learning with joy?